A reduction in stratospheric ozone cools the stratosphere. That's correct. Ozone absorbs UV radiation from the sun and heats the surrounding air. There's a bit of a domino effect. The colder stratosphere means more polar stratospheric clouds form, which destroy more ozone than dry air does. As ozone levels rise again, this effect should reverse. Could the stabilization of ozone levels in the stratosphere help to explain the subsequent ‘pause?' in the temperature rise at the surface’: Steven posed this as a question. There is no evidence he sought an answer. The answer is "no". More on that below. I've already written some articles on ozone science, so I'll not repeat everything already written. Here are some basic facts about stratospheric ozone. The troposphere contains about 90% of all the air in the atmosphere. The rest is in the upper layers, with most of the rest in the stratosphere. Ozone is only about 10 parts per million by volume of the stratospheric atmosphere (which itself has much less air than the troposphere). By contrast, CO2 is around 400 parts per million in the troposphere. The ozone layer in the stratosphere protects the surface by absorbing around 95% of UV radiation, preventing harmful UV radiation from reaching the surface. Ozone is created and destroyed by chemical reaction in the stratosphere. If not for human emissions of ozone destroying substances, the amount destroyed would balance the amount created. We inadvertently emitted long-lived ozone depleting substances, causing the ozone layer to thin, which increased UV radiation at the surface particularly at the poles. Ozone depleting substances have been progressively banned under a world-wide agreement called the Montreal Protocol, which was agreed in September 1987. Many ozone-depleting substances, and some of the replacements for ozone-depleting substances are potent greenhouse gases. Ozone itself is a greenhouse gas as well as being an absorber of short wave radiation (UV). In the troposphere these greenhouse gases add to global warming. In the stratosphere, they add to stratospheric cooling. Here's a video showing what is expected to happen to stratospheric ozone as a result of the Montreal Protocol, with what would have happened if we'd continued to dump chlorofluorocarbons into the air. What would have happened to the ozone layer if chlorofluorocarbons (CFCs) had not been regulated in the 1986 Montreal Protocol ? 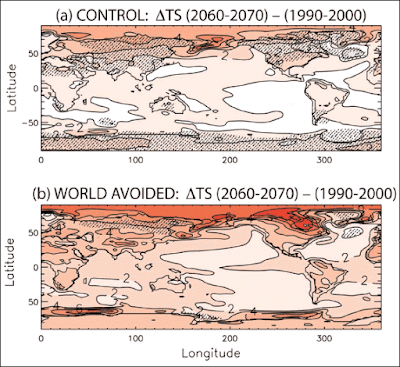 This NASA Goddard model runs from the year 1974 to 2064 and compares projected concentrations of ozone based on current emissions (left sphere), with the scenario we avoided if these emissions hadn't been reduced (right). If you are interested in ozone, you can't go past the latest ozone report: Scientific Assessment of Ozone Depletion: 2014. It's to ozone science what the IPCC reports are to climate science. Here are some more key facts I've learnt from Chapter Four of that report, on Stratospheric Ozone Changes and Climate. Direct quotes from the report are in italics. Most of the observed drop in temperature of the lower stratosphere is because of the destruction of the ozone layer: Stratospheric ozone changes are the dominant driver of observed globally averaged long-term temperature changes in the lower stratosphere. Between 1979 and 1995 global mean lower stratospheric temperature decreased by about 1 K but has since remained approximately constant. Greenhouse gases have had only a minor effect on the temperature of the lower stratosphere. In the mid and upper stratosphere, greenhouse gases and ozone changes made comparable contributions to changes in temperature, though the magnitude of change is not certain. That's based on modeling. Observed mid- and upper-stratospheric temperatures decreased from 1979 to 2005, but the magnitude of the cooling is uncertain. A newly reprocessed data set of satellite measurements exhibits substantially different cooling trends compared to the existing data set. Over Antarctica, ozone depletion has caused changes in the atmospheric circulation in the troposphere, with associated impacts at the surface and in the ocean. Among other things: Stratospheric ozone depletion has likely contributed to the observed expansion of the Southern Hemisphere Hadley Cell in austral summer. In other words, weather is shifting poleward (south) in the southern hemisphere. Climate models simulate a poleward shift of the Southern Hemisphere midlatitude maximum in precipitation and a moistening of the subtropics in response to stratospheric ozone depletion in austral summer. There is some evidence of a consistent pattern of trends in observations. In the northern hemisphere, there's not seen to be any link between climate (in the troposphere) and stratospheric ozone changes. It's all happening down south. No robust link between stratospheric ozone changes and Northern Hemisphere tropospheric climate has been found, consistent with the conclusions of the previous Ozone Assessment. Water vapour in the stratosphere plays a very important role. It is important for Earth’s radiative balance (influencing stratospheric and tropospheric temperatures) and for stratospheric chemistry. 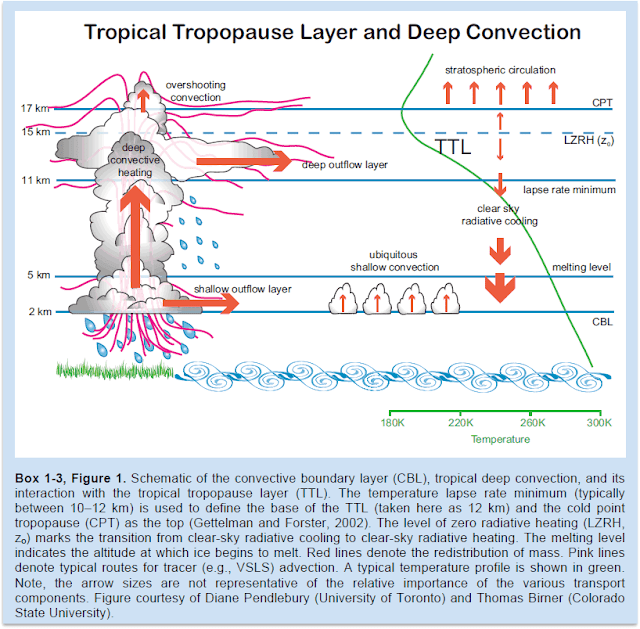 Most of it comes from the tropopause in the tropics (thunderstorms) and from the oxidation of methane (CH4). changes in water vapor alter stratospheric temperatures (and hence rates of chemical reactions) and the formation of polar stratospheric clouds. How much did Steven get right? Do greenhouse gas increases lead to stratospheric cooling? Short answer: yes, but...there is a lot of confusion about greenhouse warming and the temperature in the stratosphere. In the lower stratosphere, most of the fall in temperature observed in recent decades has been through ozone depletion. In the mid and upper stratosphere, the cooling is about equally from greenhouse gases and ozone depletion. 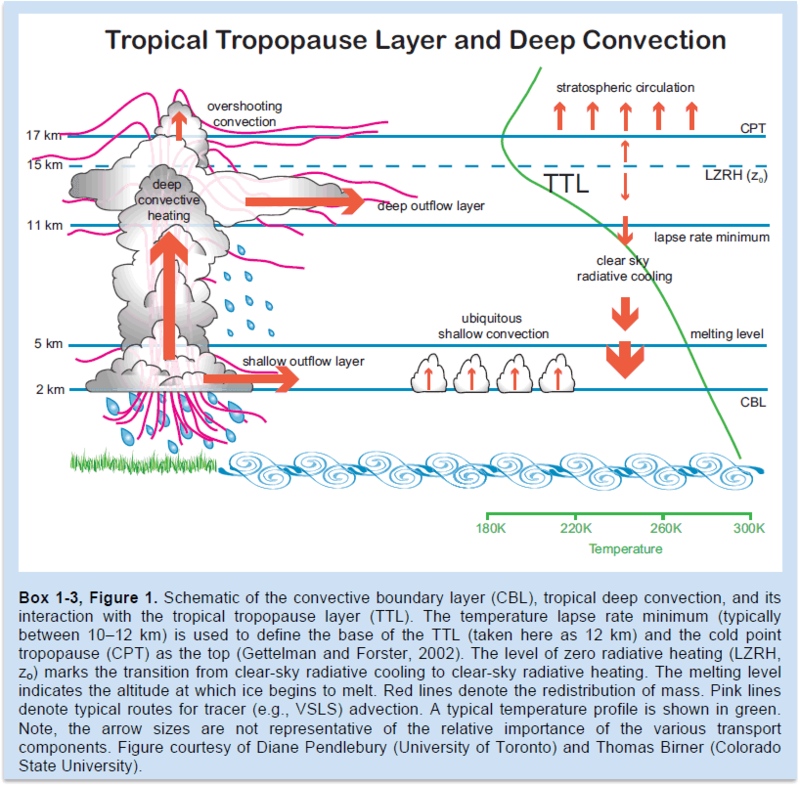 It's the lower stratosphere that has the biggest impact on the troposphere - that is, on climate. For an explanation of why greenhouse gases cool the stratosphere, there is a good article at realclimate.org. It's to do with spectral absorption of CO2, and how it emits radiation in the much thinner stratosphere, with most just going up to space. This is different in the much denser troposphere, where long wave absorption by CO2, and other greenhouse gases like water, can warm the surface and each layer above and below it in the air. Ozone holes are caused by chemical reactions that take place primarily on the surface of polar stratospheric clouds, ice particles, or liquid droplets, which form at high altitudes in the extreme cold of the polar regions. The number of particles that form, and therefore the amount of chemical ozone destruction, is extremely sensitive to small changes in stratospheric temperature. Hence, even small amounts of stratospheric cooling can greatly increase ozone depletion. stratospheric ozone depletion since 1979 likely contributes a net negative radiative forcing of around −0.05 W m-2 ± 0.1 W m-2. Stratospheric ozone absorbs energy from the ultraviolet part of the solar spectrum, heating the lower stratosphere. This part of the spectrum accounts for less than one percent of the total solar energy reaching our atmosphere. Stratospheric ozone is important because it prevent dangerous ultraviolet rays from harming plants and animals on Earth's surface, but reductions in the amount of radiation absorbed does not have a measurable impact on temperatures below. ...involve a complex interaction between projected changes in GHGs, ODSs, and the climate system. While a declining stratospheric halogen loading is expected to lead to an increase in stratospheric ozone, GHG changes will also influence ozone concentrations through direct chemical effects, climate-induced changes in chemistry, and changes in the stratospheric circulation. Such simulations show significant stratospheric cooling in the next 20–50 years, with a maximum cooling in the Antarctic lower stratosphere in response to the increased ODS concentrations (e.g., Wu et al., 2013). This cooling would maintain the polar vortex year-round by the mid-21st century (Newman et al., 2009), resulting in no final warming in the Southern Hemisphere stratosphere. Garcia et al. (2012) found surface warming of over 2 K in response to enhanced ODSs in the tropics, 6 K in the Arctic, and about 4 K in Antarctic from 2000 to 2070 (Figure 4-20). This is of comparable magnitude to GHG warming under the RCP4.5 scenario (Garcia et al., 2012), indicating that global warming over next few decades could have been doubled in the absence of the Montreal Protocol. Figure 4-20. 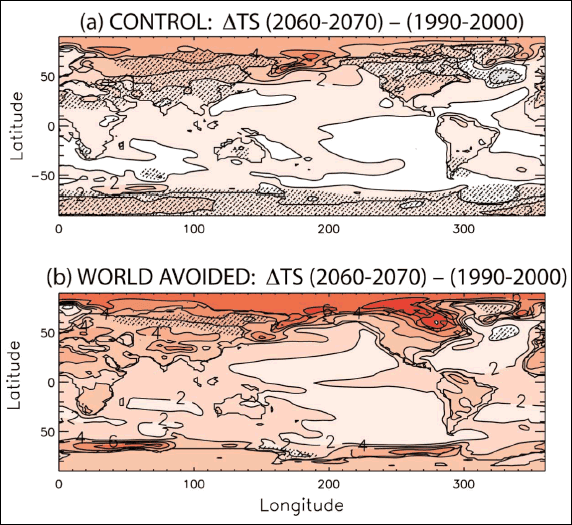 Surface temperature change (K) between the decades of 1990–2000 and 2060– 2070 in the (a) control and (b) world-avoided simulations. The former is driven by RCP 4.5 and an ODS emissions scenario that is based on the Montreal Protocol. However, in the latter, ODS emissions are not regulated until 2070. Changes in the stippled regions are not significant at the 95% confidence level. From Garcia et al. (2012). There is a lot of information about ozone that I have yet to discover. And it's quite possible that I've not got everything right in this article - so feel free to point out any errors or omissions. Unfortunately, at the IPCC, one hand seems not to know what the other is doing. And so it’s questionable whether the IPCC has considered the ozone variable when citing stratospheric cooling as an invalidator of the solar activity thesis. I'd say he hasn't read any IPCC reports. The latest one reflects what was in the 2014 ozone report - that in the lower stratosphere, ozone depletion has been having the biggest effect on temperature recently. In time though, it will be mostly CO2 all the way through from top to bottom. If it was the sun that caused the decline in stratospheric ozone all along then there are potentially serious consequences for some. Quick, someone inform the WMO about the oceans, their heat capacity, and their effect of global climate. ulriclyons thinks that less sun means a hotter planet. Talk about denier contrarians! Wrong. Surface temperature initially increases with *decreasing* solar activty, by warming of the AMO and the associated drying of continental interiors, which is what happened from 1995. High solar activity levels do the reverse, particularly by stronger solar wind states as we saw in the mid 1970’s. This is potentially huge. Definitely one of the more intriguing topics of late. In which we ditch the Montreal Protocol, pump out copious amounts of CFC's, a large portion of humanity lives underground for a few centuries and the Deniers get left behind sans radiation shielding hazmat suits. Don't overlook just how much mileage (and 'seepage') the so-called skeptics have extracted out of the record 1997-98 El Nino event. What meme will they use once the "no warming for N years" becomes obviously wrong to even the most casual observers? I have a suspicion a faint desperation is starting to develop. They'll start over again. "Look! No warming since 2015!" They will dismiss the new record as data fudging (see 2014) or if they are feeling particularly ironic say it was the result of natural variation/an exceptionally strong El Nino. Scientists, the Climate Council, and others will need to get into the media ahead of the confusion-sowers, to establish firmly in the public mind that the El Nino/La Nina events don't add energy, they only redistribute energy, like hot and cold water sloshing round you in a bath. AGW denial is a broad church, and as defeat becomes ever more obvious different fractions will turn on each other - in very, very personal terms, since that is their way. Moncktonites and Sky-Dragons will really get into it, just you watch. I-Beam is correct. National science institutions should not shy from mounting a preemptive public information campaign in the MSM explaining the effects a warming planet has on ENSO.